Donguibogam Village, Sancheong-gun, Saturday 7 September, 7am. We must have done some good work on the Blue Label the previous evening, because I wake up very groggy. The forecast for later that day is for clear skies – good news for my Jirisan hike – but for now there is little but grey. 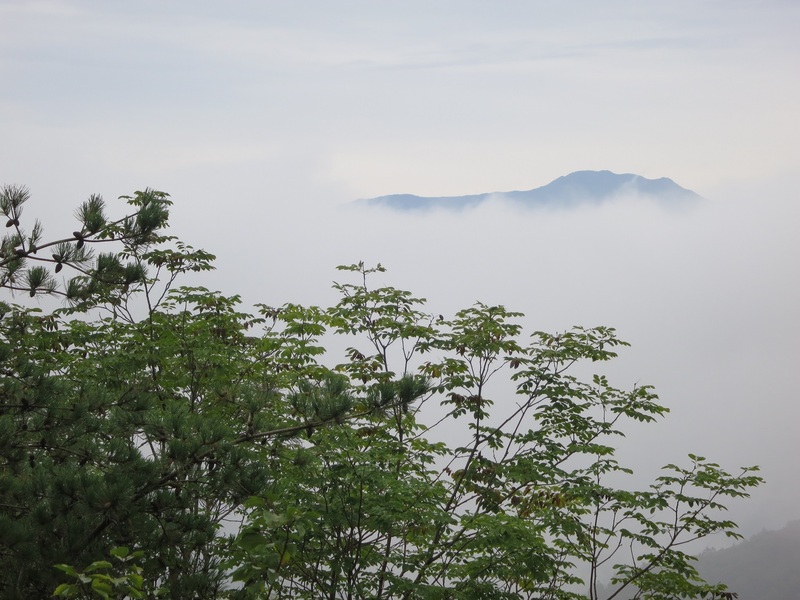 In an improvement from yesterday, we can at least see the peak of Hwangmaesan just emerging from the low cloud. We’re both very slow this morning. A muffin, some fruit, and some filter coffee manage to get us going, and then I have to figure out what to cram into my backpack for the hike. I learned the previous year that the Koreans insist on being properly attired when they go on a walk. I’m wearing the hiking pants that I bought specially for the occasion, but the hi-tech merino wool top that the hiking shop had sold me in London is impossibly hot for the weather (or maybe the hangover is playing havoc with my body temperature) and so I change into a T-shirt instead. No doubt my hiking companion will be horrified that I do not have the full outfit of clothing with the appropriate wicking properties. We have an appointment at the Sancheong Oriental Medicine Research Institute, where we are to pay a courtesy visit to Director Kim. At least, I thought it was to be a courtesy visit. We enter his office, which is like every other office of a senior Korean official I have been in. Each side of the room is lined with book-cases and display cabinets. The desk has its back to the window. In front of the desk is a square-shaped armchair with its back to the desk. In front of the chair are two parallel rows of similar armchairs for visitors, facing each other over a long, low table. The only thing that distinguished this office from other CEO offices was the display opposite the desk: a folding screen which exhibited the new health-giving herbal wallpapers which the Institute has had a role in developing. We take our seats next to the Director’s chair, and herbal teas are brought in. Without further ceremony we start talking about the presentation he is to give to a visiting team from the World Health Organisation in a couple of weeks. The WHO is visiting the Traditional Medicine Expo, as is only natural, and as part of this visit they want to get an idea of the work of the Institute. Director Kim passes me the powerpoint slides – about 40 of them for a 15 minute presentation which is to be given in both Korean and English. He’s probably got enough material for at least an hour, and it’s in desperate need of a trim. It has been translated from the Korean by someone who knows about as much of the science of herbal medicine as I do, and by someone who clearly doesn’t have English as a first language, or second or third. I first wonder whether I should make any comments, and if so how much I should say. But before I know it I have been tasked with marking up my corrections,1 and then I start getting absorbed by every minute detail. Half an hour later, I decide I’ve done enough for now: Director Kim realises he’s got far too much material and so half the slides will disappear anyway. But the other thing I am told to do is to look out for any indication that the Institute is engaged in commercial activities. The WHO visitors naturally are not interested in mundane things like making money. Instead, they will be much more interested in pure research and the advancement of medical knowledge. Unfortunately, the final and by far the largest section of the presentation is entitled “Promotion of Sancheong Herbal Medicine Industry”, which sounds suspiciously commercial to me. I tentatively raise my concerns. The Director sees my point. He discusses with Kyung-sook, and ideas are tossed back and forth. Does a whole section of the presentation need to be discarded, or can it be saved? On the one hand we need to lose a considerable number of slides, but actually there looks to be some content in this section which will be of interest the WHO despite the title. On discussion, we decide that the Korean concept translated as “Promotion” is actually more akin to “R&D Support”. Satisfied that the slides only need a minor tweak to the headings rather than a wholesale re-write, we nevertheless know that we haven’t solved the issue of how to get the presentation down to 15 minutes. We turn to the brochure which outlines the Institute’s activities. As I chew on candied bellflower root and sip the tea, I realise that I’ve got several hours’ worth of work to do if I am to get the publication into a state where an English reader is not going to give up on it after three lines (which would be a shame). 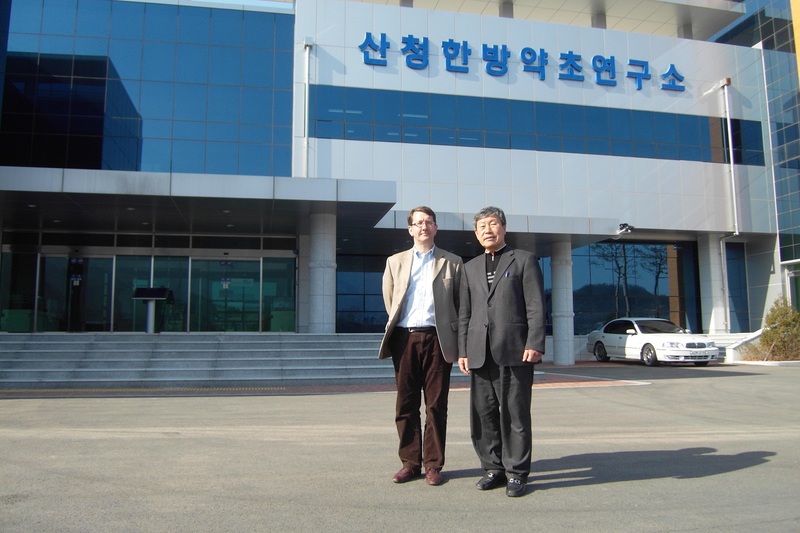 First, I have to actually understand what the Institute does; then I need to understand Sancheong’s local economic strategy, in which herbal medicine industries seem to play a key part. Then I have to understand what the brochure is trying to say about all this. What, for example, is a 기업인조합, which the brochure translates as an Enterpriser Cooperative? Kyung-sook doesn’t understand the Korean, and I don’t understand the English. And once I have overcome those hurdles, I have to get it all into fluent prose. Mr Yoon from the County Office has joined us for lunch, not quite ready for the hike, but nevertheless looking a lot more prepared than I am: he looks alert, fit and lithe despite being primarily office-based like myself.